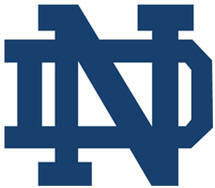 The Notre Dame Victory March is the fight song for the University of Notre Dame. It was written by two brothers who were Notre Dame graduates. Michael J. Shea, a 1905 graduate, wrote the music and his brother, John F. Shea, who earned degrees in 1906 and 1908, wrote the words. The song was copyrighted in 1908 and a piano verson, complete with lyrics, was published that year. The song's public debut came in the winter of 1908 when Michael played it on the organ of the Second Congregational Church in Holyoke. Notre Dame's fight song was first performed at Notre Dame on Easter Sunday, 1909, in the rotunda of the Administration Building. Michael Shea was the pastor of St. Augustine's Church in Ossining until his death in 1938. John Shea, a baseball monogram winner at Notre Dame, became a Massachusetts state senator and lived in Holyoke until his death in 1965. Typically the two verses are sung together, and then the chorus is sung one or more times.